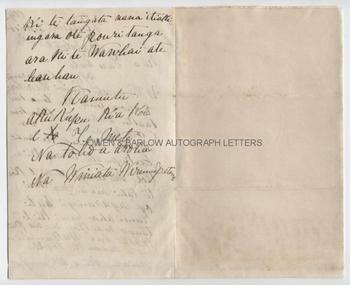 [NEW ZEALAND HAU HAU WAR 1864-5] WINIATA WIREMU PATENE Autograph Letter Signed. New Zealand Maori Tribal Leader. ALS. 2pp with integral blank leaf. In Maori with a contemporary English translation. Karakiriki. 15th September 1882. To Charles Smith. "In England the country of Queen Victoria O friend I salute you I salute you. My love to you in your absence from us. That is the end of the sighing. This is a word to you. Tell me something great (a good deal) about England. Whatever it is that you tell me will be good, also as a lamentation by you for my father William Patene, for the man by whom you were protected in the days of the darkness that is the war of the Hau-haus. My word is finished to you, O Smith. From your loving friend. From Winiata Wiremu Patene." 8vo. Approx 7.75 x 5 inches. Backed onto paper by integral blank leaf and with mounting traces to verso of blank, else near fine. William Patene (or Wiremu Patene in Maori form) was a Maori tribal leader who, in 1859, had been an early convert to Wesleyan Methodism by Christian missionaries to New Zealand. Maori Christians faced acute tensions between tribal loyalties and their commitment to the church. 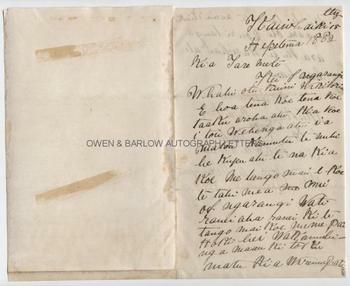 In the events that led to the New Zealand Hau Hau war of 1864-1865 he remained loyal to the British occupying force and was one of the only Maori chiefs who spoke in favour of non-violence at the tribal conference held at Ngaruawahia. In a letter to an unknown correspondent written in 1863, he said: "on my arrival I knew that evil was coming. I wrote a letter to Mr Buddle (Rev Thomas Buddle), showing the secret doings of the tribes. Afterwards I assembled my tribe. . . I said to them listen to me, all. If this evil breaks out, don't you rise up. They consented to me. When Mr Buddle's letter reached me, bidding me go to preach at Kopua. . . I went there. All the tribes of that place assembled. I said to them, if this evil breaks out, don't you rise up" (New Zealand National Library). His loyalty came at great cost. Whilst he was preaching peace at the Mangungu mission station an attempt was made to murder him by Chief Kaitoke and his adherants, who were under the influence of noted Maori necromancer named Papahurihia. A bullet passed through Patene's blanket cloak but several of his followers were killed or wounded. Patene, described as a handsome young man, stayed with the dead and the dying but many of the occupants fled for fear of further attacks. Hearing of the attack, local white settlers, led by Captain Young, arrived by canoe and a small party held off another attack on the mission. The attempt to murder Patene caused a sensation amongst the Christianised portion of the population, many of whom were bent on revenge. An army proceeded to Mangamuka under the leadership of Patuone, Waka Nene and other loyal chiefs. Although Patene continued to advocate non-violence, the Christian party stormed the rebel Pa and put to death twelve of the inmates, taking the remainder prisoners, including the leader, Kaitoke, who was wounded in the fight. This was an important event in the Hau Hau War (or Pai Marire). The Hau Hau were a religious cult that grew up around the resentment against British occupation of North Island and the controversial Maori land purchase agreements, in which the missionaries were implicated. The Hau Hau were much feared by the European settlers for their random acts of violence against isolated communities, which were often accompanied by mutilation and cannibalism. Charles Smith is probably Dr. Charles Smith of Greytown, who is thought to be one of the Europeans who came with Captain Young to Mangungu. There is also an 1861 letter in the New Zealand National Library from Patene to a "Mr Smith" concerning the arrival of Sir George Grey as the Governor of New Zealand. 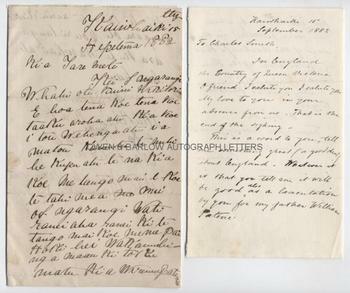 Some sources give Wiremu Patene's date of death as 1883 but this letter, written by his son, Chief Winiata Wiremu Patene, suggests that his father had died sometime prior to September 15th 1882. 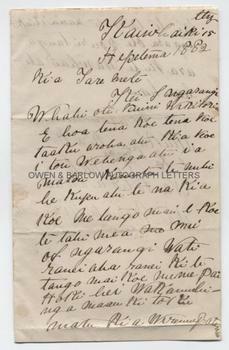 Maori letters from this period are exceedingly rare. From a 19th century family album compiled by Gladys Margaret Coles, the daughter of Frederick W. Coles an East India merchant of The Cedars, Epsom. Frederick Coles was the son of the East India Company trader, Richard Cooke Coles (1812-1888) and Elizabeth Regina Kreett, only daughter of Christopher Kreett, a British diplomat and Consul-General.